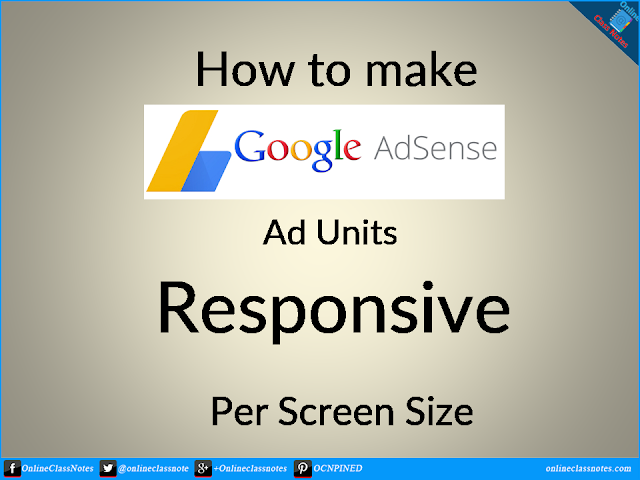 How to make adsense ads responsive per screen size? Yes, we can get responsive ad codes from adsense. But that will not fulfill the requirement for ad unit size per screen size. To make the adsense ads responsive per screen size we need to modify the code (allowed by google obviously) a bit. Reasons we need to do this can be like, In desktop view the ad appear as leaderboard, but in mobile it becomes a 300x250 square, what you might not want as you might want to show a similar horizontal sized ad in that place even in mobile view. Consider the following as your responsive ad code. Here what you have to do is, you have to change the value of the attribute data-ad-format. horizontal: All ads will be horizontal such as 728x90, 970x90, 468x60, 320x100 etc. based on available space. rectangle: All ads will be rectangle such as 336x280, 350x250 etc. based on available space. vertical: All ads will be vertical such 300x600, 160x600 etc. base on available space. auto: This is default for responsive ad unit. Any combination of the above 3 will also work, such as, "horizontal, rectangle"
You can use @media query in CSS to gain more control over the size of the ad unit. Consider the following as your responsive ad code. Please note carefully that we have added our class siteTopAdCode in the class attribute of the </ins> tag, as simply if you do not add the class, the styles will not be used on it.